BELLIN -Carte de l' Accadie et Pais Voisins . . .
BELLIN, J.N. 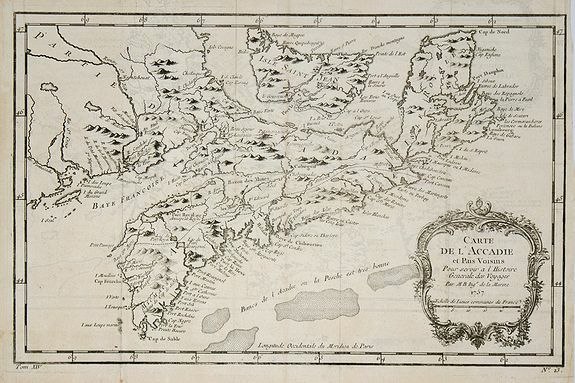 - Carte de l' Accadie et Pais Voisins . . .
Carte de l' Accadie et Pais Voisins . . . - BELLIN, J.N. Title : Carte de l' Accadie et Pais Voisins . . .. Size : 8.3 x 12.7 inches. / 21.0 x 32.3 cm. Description :A nice folding map with a decorative rococo-style cartouche. It shows in good detail Prince Edward Island, here called Isle Saint Jean, and covers all of Nova Scotia including Cape Breton. Locates numerous banks south of Nova Scotia. Condition : Engraving sligthly printed on itself while folded. Otherwise in mint condition. Part of the right margin cut short.